September 30, 2018, Honolulu, Hawaii. Carroll starts the show talking about the Red Hill fuel tanks. Carroll's research shows that the military said it is sovereign and the Hawaii Department of Health has no authority over the management of Red Hill. So, what is to be believed about the situation? Link here to story and pictures of Red Hill. Next up, Carroll talks about the many sewage spills we are experiencing, and how the government response has not been good. Consent decrees are not being followed. 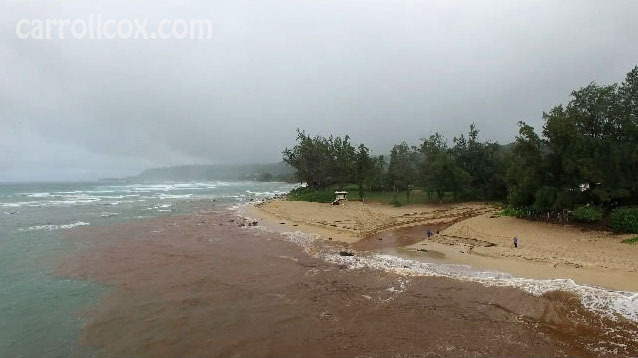 Carroll then talks about a brown water runoff into the ocean from a construction site on the North Shore, and how it is possibly suffocating the coral and other creatures in the ocean. He also talks in detail about the sewage treatment plants and the landfills. It looks like ditches are fast becoming the last remaining habitat of endangered species and other protected water birds here on the island of Oahu. But, they are not being taken care of, even when someone files a complaint. Finally, Carroll talks about the failed sea cucumber operation instigated by Suzanne Case, Chairperson of the Department of Land and Natural Resources (DLNR), and how he exposed the illegality of it. This is just one illustration of how the state does not properly respond to complaints, hoping the situation will "blow over". Unfortunately, sometimes it's too late, after illnesses occur. The point of today's show, do not trust anything the state tells you, be it Red Hill leaks, sewage spills, contaminated fish, killing seals, contaminated soil around schools, and so many other things. Things are being covered up instead of fixed. Many of our problems point back to Governor David Ige and the State of Hawaii Department of Health, currently led by a temporary director. We are concerned. The final message seems to be, particularly at the DLNR, if you do something illegal, we got your back, but if we want you to do something illegal, you will do it. Carroll tells us why. Corrupt government is not good government. Vote. Note: Carroll is following up on comments made by Chief Conservation Administrative Officer Robert Farrell at a hearing regarding a personnel matter. He disclosed the DLNR uses and relies on "black files" kept on conservation officers. More on that later. Link here to find past shows regarding Red Hill dated 2/9/14, 2/16/14, 2/23/14, 3/16/14, 4/27/14, 6/14/15, 6/21/15, 8/16/15, 9/20/15, 11/1/15, and 6/1/16. Follow: Carroll Cox, Red Hill Fuel Tanks, fuel leaks, sewage spills, landfill, sewage treatment plants, Department of Health, Department of Land and Natural Resources, DLNR, Suzanne Case, Robert Farrell.